← Yosemite – where you receive abundant natural blessings. Namibia – a spiritual and humbling journey. 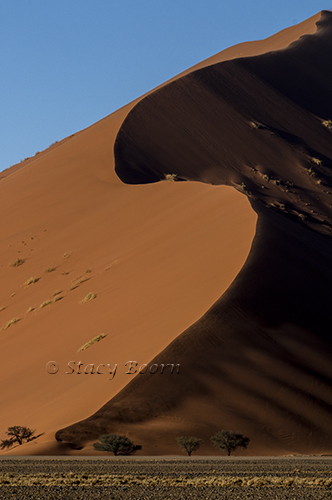 On the west coast of southern Africa, the country of Namibia is vast and mostly desolate. Bisected by the Tropic of Capricorn (we stopped at the sign), its western border is the icy Atlantic Ocean. In the east, it is bordered by the Kalahari Desert. Yet it is a land of magnificent beauty — towering sand dunes, jagged mountains, geological wonders (including diamond mines), wild animals, ancient tribes and botanical marvels. 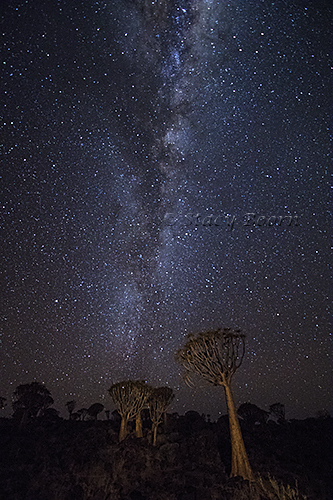 Some days it was rather cold, especially when we were outside at night photographing the Milky Way in a Quiver Tree Forest near Keetmanshoop (the farthest point south on our journey), and, though right now it is the Namibian winter, we experienced days in the desert sun that reached into the 90s. The Quiver Tree (Kokerboom in Afrikaans) is not really a tree, but a plant in the Aloe family. The “trees” are most often seen standing singly in very arid and rocky areas. They can grow to between 200 and 300 years old and reach about 30 feet in height. From a distance they look like huge lollipops on the horizon as Dr. Seuss might draw them. The trunk of the Quiver Tree is tapered and covered with a rich brown yellow-patterned bark that flakes off leaving a scaly effect on the trunk. The edges of these scales can be quite sharp. I know, because I ran my hand over one and walked away with several small nicks in my fingers. The core of the trunk is mainly fibrous which allows for water storage. Older trees bristle with a profusion of branches that are silver in appearance. The tree branches exude fine droplets of a liquid that, when dried, leaves behind a silver talcum-like powder that helps reflect the bright light, acting like a natural sun-screen keeping the trees cool. My images were captured on a 2,500 mile expedition over mostly bumpy and dusty dirt roads, and thus it will take a long time before I am finished with the necessary sorting and editing. In the meantime I will be sharing some of my favorites with a few comments in successive posts. For the creatures and the peoples that live in Namibia (lots of Lutherans) it is paradise (if you can live with very little water!). The gingerbread-looking Christ Church Lutheran in the capital city of Windhoek was built in 1907 and still has worship services in German. But my favorite choruses came at night when I heard the sounds of singing and drums in the distance and the gentle lapping of water by giraffes and rhinos in the Okaukuejo waterhole at Etosha National Park. The journey to this strange and remote land was spiritual and humbling. 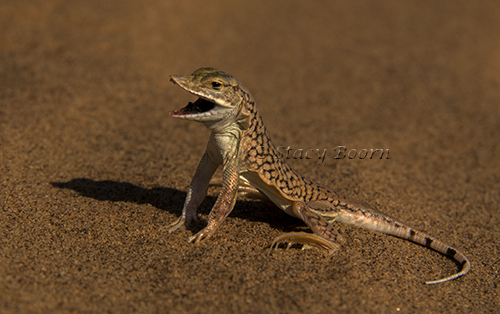 It is said we are all children of Mother Africa, and I have come to believe this after laughing with women in a Himba village and doing my own dance in the desert dunes trying to shake off a lizard that had crawled up my pant leg. (pictured here). I survived that episode, but the sights and experience of Namibia as a whole will be with me forever. 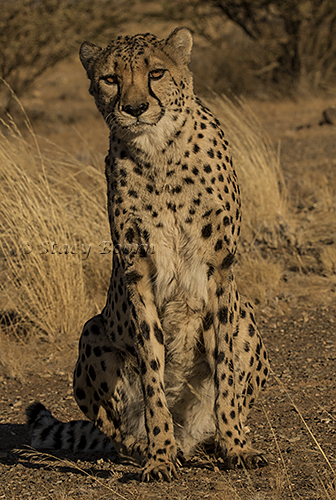 This entry was posted in Weekly 2 and tagged Cheetah, Namibia, Quiver Trees. Bookmark the permalink.